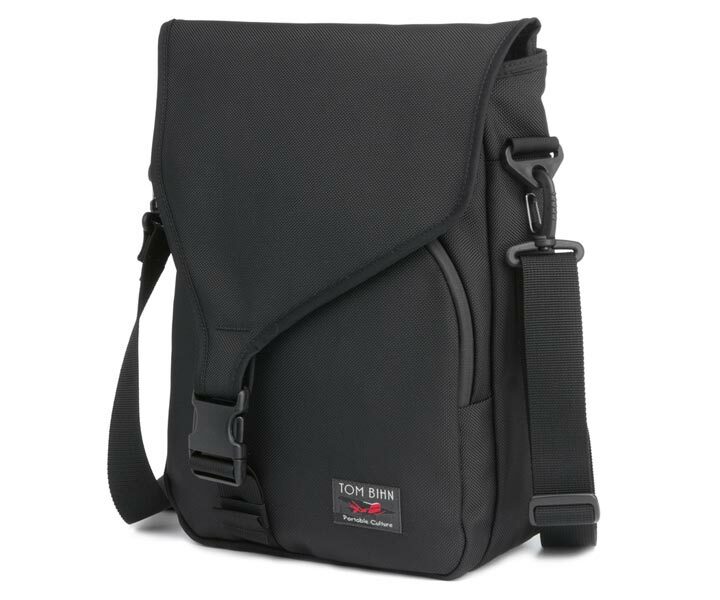 Tom Bihn contacted me after I reviewed their Western Flyer travel bag, and asked if I would like to review their Ristretto laptop bag. They didn’t need to ask twice, and just a few days later UPS were at my door, sadly with another customs bill, but we won’t go into that. I’d originally planned to use the Ristretto as my “mobile office” whilst pursuing a new job, it seemed an ideal small bag for hitting the coffee shops with my iPad. However, things moved on quickly and I decided to start my own business. I’m now working on my first contract, which is split between London and Warwick, so I’ve had a chance to use the Ristretto on a daily basis. The Ristretto is a vertical messenger bag, taller than it is wide, which makes a pleasant change from the usual messenger style. This design, combined with Tom Bihn’s excellent construction, lets the bag hang very comfortably at your side. The Ristretto is a relatively simple design with a large main section that includes the dedicated laptop compartment, a smaller zipped front pocket, and an open pocket on the back of the bag. The opening for the main section and the front pocket are covered by a large flap, which is fastened by a single large nylon buckle. I went for the largest Ristretto, designed for the 13″ MacBook, which is still a very compact bag. In fact, the Ristretto pulls off the same magic trick as my Western Flyer: it’s bigger on the inside than it looks on the outside. The main section is obviously tall given the design of the bag. I was initially concerned I might not be able to get more than a magazine or book in the main section, but it is much deeper than it appears, and will easily accommodate the power supply and cables for my MacBook Air. One downside, for me at least, of the vertical design of the Ristretto is that you end up having to stack items on top of each other, and so if you want something at the bottom of the bag you need to remove the items above. The laptop section is wonderfully simple, and yet offers excellent protection. The back of the bag is padded, which helps it retain its shape (nothing worse than a floppy bag Matron) and forms half of the laptop section, then inside the main compartment is a vertical padded wall, sewn in at the bottom and with a padded flap that goes over the top of the laptop. The bottom of the laptop compartment is slightly above the bottom of the bag so your lovely MacBook won’t ever touch the ground. Simple yet well-padded and offering all around protection. The front pocket is approximately 3/4 of the height of the main section, and is opened by two zippers; inside are two smaller pockets and two pen pockets. One pocket is approximately A5 notebook sized, but sadly my Rhodia Webnotebook would not fit – a Field Notes notebook fits with room to spare. The smaller pocket is the perfect size for an iPhone, and making for a very pleasant change both of the pen pockets will easily accommodate a full-size fountain pen. The open pocket on the back of the Ristretto is slanted at the top, and perfect for magazine, A4 pads or papers. There is a simple handle on top of the bag which despite its relatively small size is nicely padded and comfortable even for my big hands. Tom Bihn supplied their fabulous Absolute Shoulder strap with my Ristretto. I wrote about this strap in my Western Flyer review, and consider it the standard by which all shoulder straps should be measured. The foam section in the middle is both brilliantly grippy, I hate fighting to keep a bag on my shoulders, and has enough elasticity to cushion the weight of your bag – it honestly seems to make the bag feel lighter. The Ristretto is made from the same high-quality materials as the Western Flyer: 1050 denier ballistic nylon on the outside, and lightweight Japanese Dyneema on the inside. Both are great materials, which a nice feel and look as if they will wear incredibly well. The Ristretto is very light despite its tough materials; a bag really should weigh no more than the laptop it is designed to protect, and yet so many do. The padding for the laptop section and back of the bag is about 0.5 cm thick and fairly soft in comparison to some other neoprene foam laptop cases I’ve used, but it does feel as if it will offer protection for all but the biggest of impacts. The inside of the laptop section is neoprene at the front and Dyneema at the rear, both are soft and smooth and will not mark your MacBook. The zips are the same excellent YKK Aquaguard water-repellent zippers as on the Western Flyer, and as with the Absolute Strap these are the zips I now compare all zips with; they are smooth, strong and of course, have the clever water-repellent rubbing coating. The buckle that closes the flap over the main section and front pocket is the amazingly named Duraflex Warrior buckle. The ‘Warrior’ buckle is typical Tom Bihn: incredibly tough, and long lasting, yet simple and easy to use. This buckle looks strong enough to hang a small car from but is easily opened with one hand. Perfect. 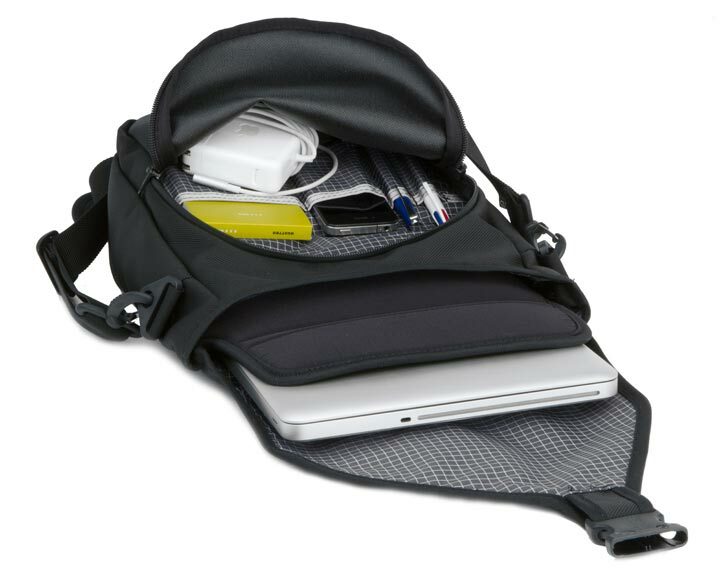 The Ristretto is a great simple, almost minimalist, laptop bag. It’s well designed and well made, as you would expect from Tom Bihn, using the best materials and components for the job. It’s surprisingly capacious given its relatively small dimensions and offers excellent laptop protection. For me the Ristretto is a little too simple for an everyday laptop bag; I need more space and more pockets, and since hurting my back last year I now use a backpack. But I originally intended to use the Ristretto as a coffee shop or conference bag, and for times when I want to travel lighter – and for this it is perfect.